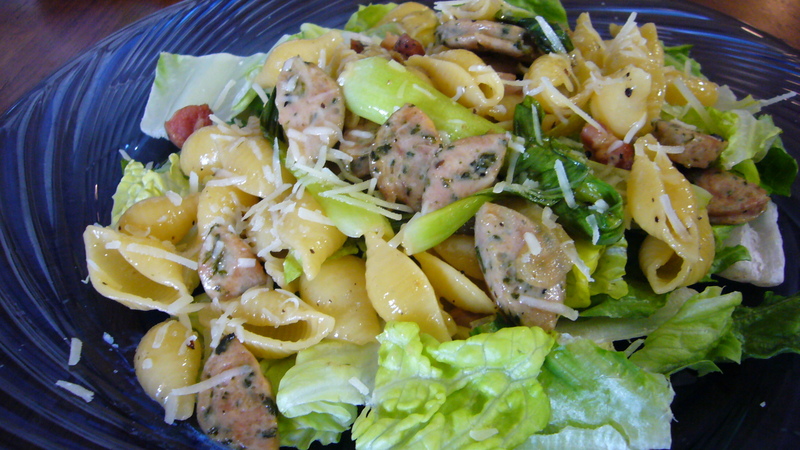 I had a time this weekend to make my lunch on Saturday, so I thought I would make a pasta with some chicken sausage and use a bit sauce that I made from pan dripping a few days previous and froze. I used a medium shell Pasta and cooked them until aldente. While they were cooking I cut up some baby bok choy and half a small shallot. I was really trying to make a single portion. I pan fried the onion with a very small amount of pancetta. I didn’t add any garlic. I had to go to a party later and I didn’t want to have the fearful halitosis. The chicken sausage was cooked so that it was heated through, and then I tossed in the bok choy leaves along with the sauce that I had let defrost a bit. I let that all come together and then removed the pasta saving the water just just in case I let the sauce reduce too much. 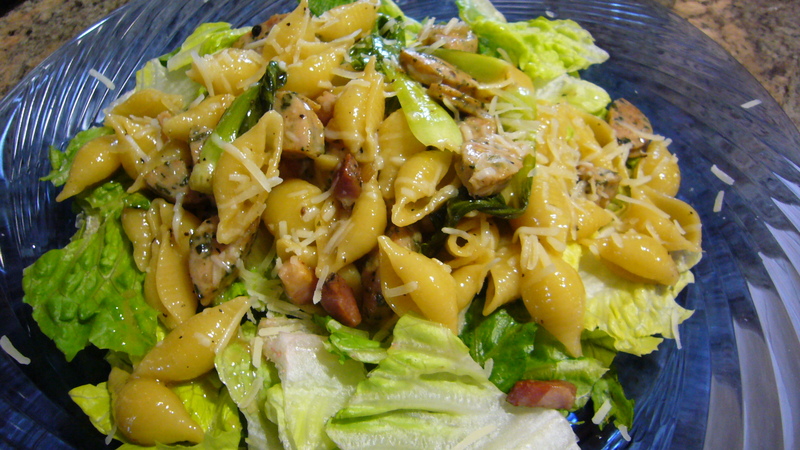 Tossed the pasta for a few turns of the and then I placed it over a bed of romaine lettuce. I was pleased with my lunch result. I made a bit too much so I ended up taking some with me to work, but I zapped it at work to warm it up and it kept nicely. ← Lunchy goodness on the fly! nice post. i love sauces too! I have a post myself, entitled, I will be the sauce queen! Thanks for sharing! Sauce Queen! I love it! Thank you so much for your comment Adrienne. I am so happy to share.